Faster Than Sound is a one-day festival that combines music and digital art forms and is part of the Aldeburgh Music Festival. We presented Sonumbra, a freestanding structure resembling a large umbrella frame, that holds a funnel-shaped canopy of electroluminescent fibres. The glowing fibres glow respond to movement around them to create flowing light patterns on the canopy. The atmosphere of musical rhythms, harmonies and luminous patterns are composed by the visitors movement – either active or passive. 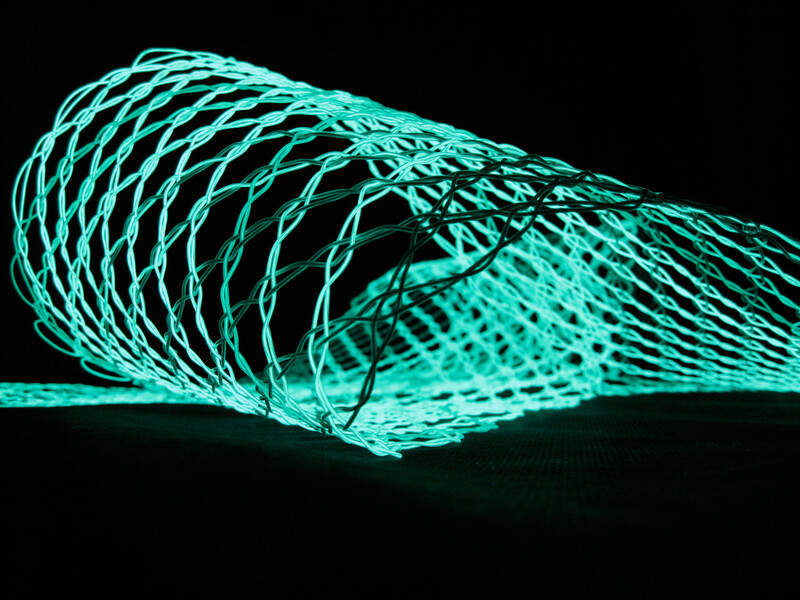 The light emitting fabric of the umbrella is crafted into a lacework of many electroluminescent fibres. This latticed pattern is animated in concert with the generated surround sound and visually illustrates the visitors position within the constellation. Wandering unaware or actively gravitating towards Sonumbra each person plays a part and becomes a note in a unique composition of light, sound and space. Share the post "Faster Than Sound 2007"